1) (Salisbury, co. Wilts). Az. three gillyflowers ar. 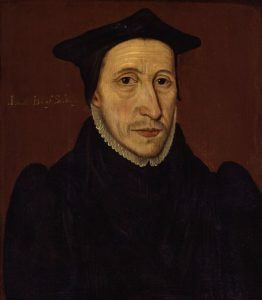 2) or Jule – (Bowden, co. Devon; of this family was John Jewell, Bishop of Salisbury, 1560-71). Or, on a chev. az. betw. three gillyflowers gu. stalked and leaved vert, a. maiden’s head of the field, ducally crowned of the third, on a chief sa. a hawk’s lure double stringed betw. two falcons ar. beaked and legged of the first. Crest—A cubit am vested az. cuffed ar. holding in the hand ppr. a gillyflower, as in the arms. 3) (quartered by Thomas Lovett, Esq., of Astwell, co. Northants, whose dau. Elizabeth, was wife of Sir William Chester, Knt., Mayor of London 1559. Visit. London, 1568). Per pale or and az. a chev. erm. 4) or Jule – (Scotland). Or, a chev. az. betw. three gillyflowers gu. slipped and leaved vert, on a chief of the third a hawk’s lure betw. two popinjays of the field. Crest—A dexter hand holding a gillyflower ppr. This surname, like Jewlson, is a baptismal one meaning “the son of Joel”. It comes from the Old English words juel and jewel. One author notes that it not only refers to a precious stone, but also means joy, meath, and preciousness, and is a name that expresses fondness. The Danish form is Hjul, Juell, or Juuel. Another author claims it’s a corruption of the French Jules and Julius. Another author writes the name is of a Cornish or Breton origin, coming from the ancient Celtic personal name, Old Breton ludicael, which consists of the words lord, generous, and bountiful, and was a name held by a seventh century saint who was a King of Brittany. He lives in a monastery. In later Medieval times it became ledecael and later Gicquel, surviving in modern French as Jezequel. Variants found in East Anglia and Yorkshire include Jiggle, Jewell, Jockle, Joel, Joule, and Jekyll. Another author notes it was the personal name of Judhael de Totnes, a prominent supporter of William the Conqueror during his invasion of England, who later became a Baron and held lands in both Devon and Cornhall. He was recorded in the Domesday Book. Early recorded persons bearing this surname include Warin filius Juelis, Juel de Stanhuse, and Juel de Buketon, all found in county Devon recorded in the Testa de Neville, sive Liber Feodorum during the time of Henry III and Edward I. The earliest recorded person was Richard Juel who was documented in the Assize Rolls of Bedford county in 1247 AD. Other documented persons include Jordan filius Juel and Jordan filius Jowell recorded in the Calendarium Genealogicum, William Juel recorded in Kirby’s Quest, John Juel in C.R., and John Jowell (sheriff of Norwich) recorded in 1486 in the History of Norfolk. There even mixtures of the old and new form: Joell Juell, recorded in 1639. Early Americans bearing this surname include 1) George Jewell, a mariner, living during in Saco, Maine during 1637, 2) Joseph Jewell, living in Watertown, perhaps only a transient resident driven away by the fear of Indian hostility, who with his wife Martha had two children: Joseph (1673) and Martha (1675), 3) Samuel Jewell recorded in 1655 in Boston and 4) Thomas Jewell of Braintree in 1639, who had a grant of 12 acres, and with his wife Grizell had children: Joseph (1642), Nathaniel (1648), Grizell (1652), and Mercy (1653). Others include Robert Jewell (Virginia 1634), Walter Jewell, who came on the ship America from the port of London (Virginia 1635), and Thomas Jewell (Massachusetts, 1635). A one Christopher Jewell was recorded as prisoner sent to Barbados in the 17th century.